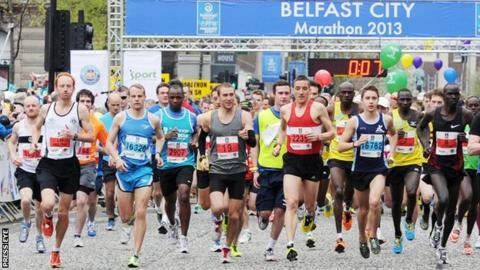 Favourite Joel Kipsang Kositany took victory in the men's race at Monday's Belfast City Marathon. The Kenyan crossed the line in 2:19.28 which was almost six minutes down on the course record set last year. However, there was a new women's course record as Ukrainian Natalia Lehonkova clipped more than two minutes off the previous best with a 2:36.50 clocking. That cut two minutes and 12 seconds off Alice Chelangat's event best of 2:39.02 set a year ago. Kositany went into the Monday's event with a personal best of 2:09.50 set in a marathon in Israel 16 months ago. Ethiopia's Urga Negewo set the event record of 2:13.41 when winning 12 months ago but this year's field was weakened by visa difficulties which prevented several planned elite entrants from arriving in Belfast. Kositany finished 29 seconds ahead of his compatriot James Rotich (2:19.57) with another Kenyan Freddy Situk (2:24.39) in third, top local man Thomas Frazer (2:26.24) a battling fourth and 52-year-old previous winner Tommy Hughes (2:32.28) a hugely commendable sixth. Former St Malachy's College student Frazer was delighted with his performance which was the best local performance by a local male since Hughes's 1998 victory. "I exceeded my expectations," US-based Frazer, 31, told BBC Radio Ulster. "I wanted to be in and around 2:30 so I'm around four minutes faster than that. "I ran a 2:18 marathon last year but my training has really been restricted this year because of injury and it's only in the last four weeks that I've been able to train at the capacity that I would have wanted." Frazer set his personal best of 2:18.37 in the US last year and plans to chase the 2014 Commonwealth Games standard of 2:18.00 later this year. Joe McAlister helped pace Frazer over the opening miles before dropping out while Stephen Scullion also opted to sample the Belfast atmosphere by running for a number of miles before his planned drop-out. Ukrainian Lehonkova shook off pre-race favourite Helen Cherono Kosgei in the final two kilometres to take victory in a very competitive women's race. Kenyan Cherono Kosgei, who has a personal best of 2:29.33, finished 18 seconds behind the winner which left her almost two minutes inside the previous course record. Another Kenyan Sarah Kerubo took third in 2:40.14 while Julie Balmer was top local woman as she clocked 3:00.29 to finish fourth overall.